On the first day of Christmas, my true love gave to me... an iPad Air! Haha... forget the traditional words to this Christmas Carol. 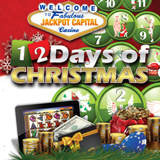 Jackpot Capital Mobile Casino is celebrating the Twelve Days of Christmas by giving away iPads, Amazon Gift Cards, free spins and cash prizes. Beginning Christmas Day and continuing for twelve days, randomly chosen mobile casino games players will win prizes. There won't be any Partridges in Pear Trees, French Hens or Turtle Doves. Who needs 'em anyway?! There will be much better gifts for online casino players, like the five iPad Minis that will be awarded on the fifth day of Christmas! Play any of Jackpot Capital’s nine amazing mobile slots games this month and you're eligible to win. Not surprisingly, the Naughty or Nice mobile slot game has been the casino’s most popular mobile game this month. It’s a 5-reel 50 pay line slot where Nice Girls and Naughty Girls are both wild and five Nice Girls wins the jackpot. It was extremely popular last Christmas when it first came online and has been a holiday hit with mobile casino players this year. Until December 31, mobile players can claim a special Naughty or Nice Casino Bonus by entering coupon code SEXYMOBILE when they deposit. Mobile deposits up to $100 will be doubled. Jackpot Capital Mobile Casino players enjoy the same friendly customer service and easy deposits and withdrawals as the casino’s online players.